Last night I dreamt that I had a dream. In the dream I had devised a word game something similar to Jumbles. 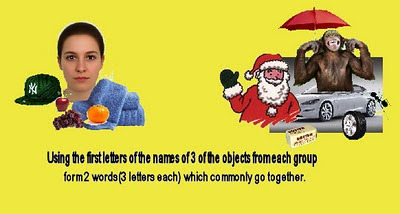 the first letters of the names of objects in each group. commonly is associated with one word from the second group. totally remember the details of the dream. I can not recall what all of the objects were. This is the result of what I do remember of the dream that I dreamt. It wiil be relatively simple because it involves only 3 letter words. Try this and tell me what words you get.